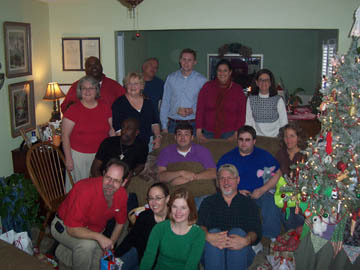 Director Karen Musgrove is second from the right on the top row. Birmingham AIDS Outreach was started in 1984 by a group of concerned citizens who decided that something needed to be done to respond to the AIDS epidemic. The agency incorporated in 1985, and it is the oldest ASO in Alabama. Birmingham AIDS Outreach has a professional staff of 12, including two case managers and an assistant who deals only in transportation. They are supported by many loyal volunteers who dedicate their time to answer phones and run the front office, as well as work on special projects. Each year, Birmingham AIDS Outreach puts on an innovative fundraiser around Valentine’s Day called “Valentine Dine.” This year it will be held on February 10. The event consists of a series of small dinner parties held in private homes all over Birmingham, followed by a Dessert and Champagne Party and Celebrity Plate Auction at 9 pm in the DoubleTree Hotel. Celebrities who have contributed plates this year include Madonna, Bono, Barry Manilow, Sally Struthers, Leann Rimes, Jim Bullock, Courteney Cox and David Arquette, Ty Herndon and many, many more. Another well-known local artist, Kim Graham-Smith, has contributed a plate featuring her character “Porcupine Coyote.” “The ‘Porcupine Coyote’ plate will probably go for $800 to $1,000,” Karen says. 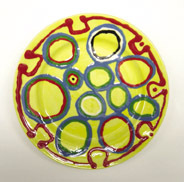 Last year’s Valentine Dine raised around $70,000 for the agency, with $20,000 coming from the auction of the plates. “With Madonna and Bono contributing plates this year, I don’t know what will happen,” Karen says. More information about the agency is available on-line at birminghamaidsoutreach.org.